How to track progress in the Build-Measure-Learn Loop? Tldr: The Venture Pyramid is the new frame to progress on a venture. Build-Measure-Learn is the operating rhythm to climb the pyramid and to get to Product-Market-Fit as soon as possible. 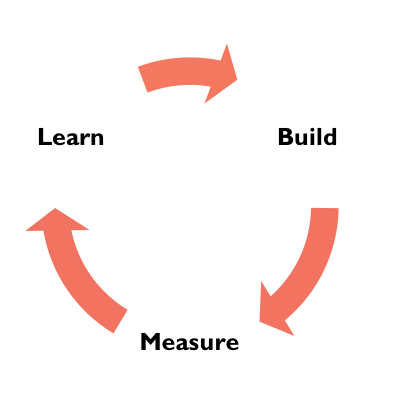 The idea of the Lean Startup Build-Measure-Learn Loop is to create validated learning through experimenting on a critical hypothesis. An entrepreneur or intrapreneur identifies his/her riskiest assumption and picks the leanest way to test this assumption. He formulates a hypothesis that is specific to the research context and runs the experiment. It’s very important, that the experiment is associated with a potential progress in the market, since the market brings the greatest amount of uncertainty. 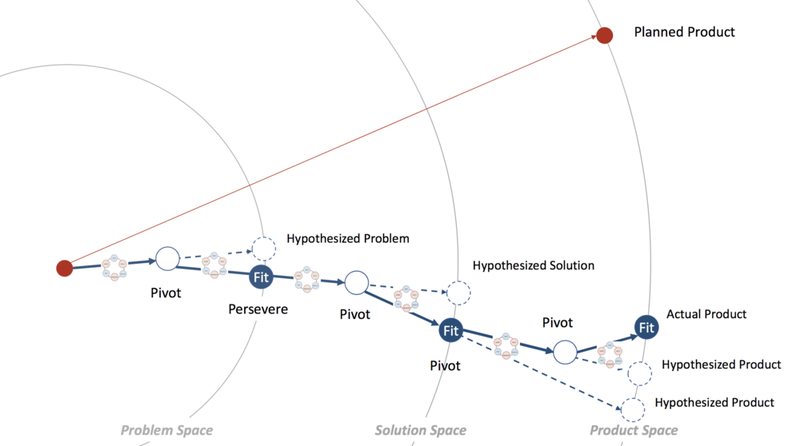 As soon as the experiment is concluded, an entrepreneur or intrapreneur can decide whether to persevere on an existing track or to pivot into a different direction. The basic idea of „The Lean Startup“ is to get through this loop as fast as possible. The problem is, that the Build-Measure-Learn Loop itself does not provide any information on your progress on a venture. You do not know where you are standing. It is especially for internal teams of innovation units extremely difficult to show how they are making progress. I see the Build-Measure-Learn Loop as a means to an end. However, I have experienced that these ends are very often dropped in the whole discussion, since the focus is more on the experiments. „We need to run a smoke test!“, „We need to develop an MVP!“ etc. The ends of the different activities are displayed through the Venture Pyramid. Thus Build-Measure-Learn Loops are aimed towards Problem-Solution-Fit, Business-Model-Fit etc. The Venture Pyramid has been introduced in my last article. We have seen, that many companies that want to drive innovation, are focusing too much on technical artifacts, rather than on the progress in the market and their generated learning. The Venture Pyramid helps entrepreneurs and intrapreneurs to structure the search for a repeatable and scalable business model, while progressing in the market. The combination of the Venture Pyramid and the Build-Measure-Learn loop will allow Innovation Accounting at its best. It will make it easy for CEOs and investors to see where the venture is right now in their progress and it will help entrepreneurs and intrapreneurs to search for a replicable and scalable business model. Entrepreneurs, choose your options wisely! To bring these concepts together, we need to understand the Venture Pyramid a bit differently. At the end, the venture pyramid exists of multiple options. If an entrepreneur/intrapreneur makes an evidence-based decision to focus on a market, he starts searching for problems that are in this market. He/She prioritizes the problem based on observations and assumptions and is starting to validate these problem assumptions. With this process of prioritization and validation, he/she is trying to find a problem with the highest relevance and magnitude. There are multiple problems in a market and there are multiple solutions to a problem etc. I understand these number of options in reference to Frederiksen/Brem as spaces of options. That means, we have a space of potential markets, a space of problems for a market, a space of problems for a solution, various options for products on a solution and so on. This can be illustrated as showed below. In an option space, whether it is the problem, solution, product or business model space, an entrepreneur is confronted with different potentials. It is important that he discovers the possible options and their potentials to form a decision within an option space, without falling into analysis paralysis. An entrepreneur or intrapreneur should always look for a global maximum to gain traction on a venture. What happens in the traditional waterfall-like planning process, is that you have an idea for a product, line out this product and start to develop it. This builds on the belief, that the assumptions on the market, problem and solution are validated. And this means, that you are sure that you have already picked the best possible option in each space. But in a traditional product or business innovation process, this is very often not the case, as we all know. People cognitively eliminate all other options and keep flawed assumptions on a business. Established companies are used to work in very certain environments, changes in plans and predictions are often punished by the system. This leads to an even stronger focus on once developed assumptions and thus once chosen options. A lean entrepreneur runs experiments to validate or invalidate his/her assumption in a space of options. These experiments are always targeted to achieve the different levels of "Fit" of the Venture Pyramid (e.g. Customer-Problem Fit). There are also learnings and validations that don't contribute directly to achieving a level of "Fit", but the more these other learnings become, the higher the risk of being stuck in "analysis paralysis". For example, having outlined a persona in the customer-problem space can very easily result into a 100% validation of the demographics, psychographics or sociographics. However a 100% information is at this stage not important, since an entrepreneur is not a scientist who aims to achieve perfect knowledge, but a person who wants to progress in the market. The illustration below shows, how the combination of the Venture Pyramid and the Build-Measure-Learn Loop looks like. The power of combining the Venture Pyramid with the Build-Mesaure-Learn Cycle lays in the ability to start a process of rigorous learning with clear targets. But not development targets, but traction targets. At the end, there will be by far more pivots in the process of creating venture success, than one anticipates. And it is very important to understand, that this is not only the case for startups, but also for ventures inside a company. The illustration shows only one case. There can be abortions on venture, when an entrepreneur needs to get back to the start or the runway ends etc. However, it helps to get a holistic understanding of the entrepreneurial process. With this understanding, it will be easier for Entrepreneurs an Intrapreneurs to measure the outcome at each level of the pyramid. The article aims to bridge the two very important entrepreneurial concepts of Build-Measure-Learn and the Venture Pyramid, to get a deeper understanding of the entrepreneurial process and to be able to track the progress on a venture. In the end, having real progress in the market is the only thing that really matters for entrepreneurs as well as for intrapreneurs, since both have only a limited runway to get to the FIT. Dr. Lutz Göcke is the founder of the innovation consultancy Swan Ventures which offers services and SaaS-tools that help you climb the Venture Pyramid with speed and at low cost. Lutz is a Serial-Intrapreneur, Startup-Mentor and a Lecturer on Entrepreneurship, Innovation and Strategic Management. How can corporates engage in venturing? You give up things when you sign up for this newsletter!